"Green screen" redirects here. For other uses, see Green screen (disambiguation). For the electronic music project, see Chroma Key. For musical tonality depending on key, see Key (music). Today's practicality of green-screen compositing is demonstrated by Iman Crosson in a self-produced YouTube video. Top panel: A frame of Crosson in full-motion video as shot in his own living room. Bottom panel: Frame in the final version, in which Crosson, impersonating Barack Obama, "appears" in the White House's East Room. Chroma key compositing, or chroma keying, is a visual effects/post-production technique for compositing (layering) two images or video streams together based on color hues (chroma range). The technique has been used in many fields to remove a background from the subject of a photo or video – particularly the newscasting, motion picture, and video game industries. A color range in the foreground footage is made transparent, allowing separately filmed background footage or a static image to be inserted into the scene. The chroma keying technique is commonly used in video production and post-production. This technique is also referred to as color keying, colour-separation overlay (CSO; primarily by the BBC), or by various terms for specific color-related variants such as green screen, and blue screen – chroma keying can be done with backgrounds of any color that are uniform and distinct, but green and blue backgrounds are more commonly used because they differ most distinctly in hue from most human skin colors. No part of the subject being filmed or photographed may duplicate the color used as the backing. It is commonly used for weather forecast broadcasts, wherein a news presenter is usually seen standing in front of a large CGI map during live television newscasts, though in actuality it is a large blue or green background. When using a blue screen, different weather maps are added on the parts of the image where the color is blue. If the news presenter wears blue clothes, his or her clothes will also be replaced with the background video. Chroma keying is also common in the entertainment industry for visual effects in movies and video games. Prior to the introduction of travelling mattes and optical printing, double exposure was used to introduce elements into a scene which were not present in the initial exposure. This was done using black draping where a green screen would be used today. George Albert Smith first used this approach in 1898. In 1903, The Great Train Robbery by Edwin S. Porter used double exposure to add background scenes to windows which were black when filmed on set, using a garbage matte to expose only the window areas. The blue screen method was developed in the 1930s at RKO Radio Pictures. At RKO, Linwood Dunn used an early version of the travelling matte to create "wipes" – where there were transitions like a windshield wiper in films such as Flying Down to Rio (1933). Credited to Larry Butler, a scene featuring a genie escaping from a bottle was the first use of a proper bluescreen process to create a traveling matte for The Thief of Bagdad (1940), which won the Academy Award for Best Special Effects that year. In 1950, Warner Brothers employee and ex-Kodak researcher Arthur Widmer began working on an ultraviolet travelling matte process. He also began developing bluescreen techniques: one of the first films to use them was the 1958 adaptation of the Ernest Hemingway novella, The Old Man and the Sea, starring Spencer Tracy. Petro Vlahos was awarded an Academy Award for his refinement of these techniques in 1964. His technique exploits the fact that most objects in real-world scenes have a color whose blue-color component is similar in intensity to their green-color component. Zbigniew Rybczyński also contributed to bluescreen technology. An optical printer with two projectors, a film camera and a 'beam splitter', was used to combine the actor in front of a blue screen together with the background footage, one frame at a time. In the early 1970s, American and British television networks began using green backdrops instead of blue for their newscasts. During the 1980s, minicomputers were used to control the optical printer. For the film The Empire Strikes Back, Richard Edlund created a 'quad optical printer' that accelerated the process considerably and saved money. He received a special Academy Award for his innovation. For decades, travelling matte shots had to be done "locked-down", so that neither the matted subject nor the background could shift their camera perspective at all. Later, computer-timed, motion-control cameras alleviated this problem, as both the foreground and background could be filmed with the same camera moves. Meteorologists on television often use a field monitor, to the side of the screen, to see where they are putting their hands against the background images. A newer technique is to project a faint image onto the screen. Some films make heavy use of chroma key to add backgrounds that are constructed entirely using computer-generated imagery (CGI). Performances from different takes can be composited together, which allows actors to be filmed separately and then placed together in the same scene. Chroma key allows performers to appear to be in any location without leaving the studio. Computer development also made it easier to incorporate motion into composited shots, even when using handheld cameras. Reference-points can be placed onto the colored background (usually as a painted grid, X's marked with tape, or equally spaced tennis balls attached to the wall). In post-production, a computer can use the references to compute the camera's position and thus render an image that matches the perspective and movement of the foreground perfectly. Modern advances in software and computational power have eliminated the need to accurately place the markers – the software figures out their position in space (a disadvantage of this is that it requires a large camera movement, possibly encouraging modern film techniques where the camera is always in motion). The principal subject is filmed or photographed against a background consisting of a single colour or a relatively narrow range of colours, usually blue or green because these colours are considered to be the furthest away from skin tone. The portions of the video which match the pre-selected color are replaced by the alternate background video. This process is commonly known as "keying", "keying out" or simply a "key". Green is used as a backdrop for TV and electronic cinematography more than any other colour because television weathermen tended to wear blue suits. When chroma keying first came into use in television production, the blue screen that was then the norm in the movie industry was used out of habit, until other practical considerations caused the television industry to move from blue to green screens. Broadcast quality color television cameras use separate red, green and blue image sensors, and early analog TV chroma keyers required RGB component video to work reliably. From a technological perspective it was equally possible to use the blue or green channel, but because blue clothing was an ongoing challenge, the green screen came into common use. Newscasters sometimes forget the chroma key dress code, and when the key is applied to clothing of the same color as the background, the person would seem to disappear into the key. Because green clothing is less common than blue, it soon became apparent that it was easier to use a green matte screen than it was to constantly police the clothing choices of on-air talent. Also, because the human eye is more sensitive to green wavelengths, which lie in the middle of the visible light spectrum, the green analog video channel typically carried more signal strength, giving a better signal to noise ratio compared to the other component video channels, so green screen keys could produce the cleanest key. In the digital television and cinema age, much of the tweaking that was required to make a good quality key has been automated. However, the one constant that remains is some level of color coordination to keep foreground subjects from being keyed out. Before electronic chroma keying, compositing was done on (chemical) film. The camera colour negative was printed onto high-contrast black and white film, using either a filter or the colour sensitivity of the black and white film to limit it to the blue channel. Assuming this film was a negative it produced clear where the blue matte screen was, black elsewhere, except it also produced clear for any white objects (since they also contained blue). Removing these spots could be done by a suitable double-exposure with the colour positive, and many other techniques. The end result was a clear background with an opaque shape of the subject in the middle. This is called a female matte, similar to an alpha matte in digital keying. Copying this film onto another high-contrast negative produced the opposite 'male matte'. The background negative was then packed with the female matte and exposed onto a final strip of film, then the camera negative was packed with the male matte was double-printed onto this same film. These two images combined together creates the final effect. The most important factor for a key is the color separation of the foreground (the subject) and background (the screen) – a blue screen will be used if the subject is predominantly green (for example plants), despite the camera being more sensitive to green light. In analog color TV, color is represented by the phase of the chroma subcarrier relative to a reference oscillator. Chroma key is achieved by comparing the phase of the video to the phase corresponding to the pre-selected color. In-phase portions of the video are replaced by the alternate background video. In digital color TV, color is represented by three numbers (red, green, blue intensity levels). Chroma key is achieved by a simple numerical comparison between the video and the pre-selected color. If the color at a particular point on the screen matches (either exactly, or in a range), then the video at that point is replaced by the alternate background. A studio shot taken in front of a green screen will naturally have ambient light the same color as the screen, due to its light scattering. This effect is known as spill. :p20 This can look unnatural or cause portions of the characters to disappear, so must be compensated for, or avoided by using a larger screen placed far from the actors. The depth of field used to record the scene in front of the colored screen should match that of the background. This can mean recording the actors with a larger depth of field than normal. A chroma key subject must avoid wearing clothes which are similar in color to the chroma key color(s) (unless intentional e.g., wearing a green top to make it appear that the subject has no body), because the clothing may be replaced with the background image/video. An example of intentional use of this is when an actor wears a blue covering over a part of his body to make it invisible in the final shot. This technique can be used to achieve an effect similar to that used in the Harry Potter films to create the effect of an invisibility cloak. 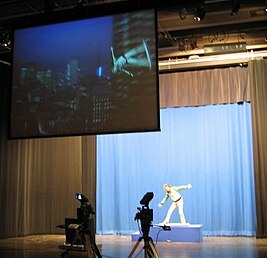 The actor can also be filmed against a chroma-key background and inserted into the background shot with a distortion effect, in order to create a cloak that is marginally detectable. Difficulties emerge with blue screen when a costume in an effects shot must be blue, such as Superman's traditional blue outfit. In the 2002 film Spider-Man, in scenes where both Spider-Man and the Green Goblin are in the air, Spider-Man had to be shot in front of the green screen and the Green Goblin had to be shot in front of a blue screen. The color difference is because Spider-Man wears a costume which is red and blue in color and the Green Goblin wears a costume which is entirely green in color. If both were shot in front of the same screen, parts of one character would be erased from the shot. For a clean division of foreground from background, it is also important that clothing and hair in the foreground shot have a fairly simple silhouette, as fine details such as frizzy hair may not resolve properly. Similarly, partially transparent elements of the costume cause problems. Blue was originally used for TV chroma keying special effects because human skin tone contains very little blue, and because the film industry used blue backgrounds for similar purposes. The color blue was tied to the blue emulsion layer of film having comparable grain and detail in comparison to the red and green layers of the emulsion. In television and digital filmmaking, however, green has become the favored color because of some practical considerations, and because lossy compression algorithms used in both analog and digital TV distribution retain more detail in the green channel. The choice of color is up to the effects artists and the needs of the specific shot. 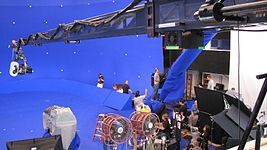 Whereas the blue screen was introduced to the television industry by the film industry, the use of green screen visual effects has been introduced to the film industry as electronic imaging has augmented and replaced the use of chemical film stock in cinema. Also, the green background is favored over blue for outdoor filming where the blue sky might appear in the frame and could accidentally be replaced in the process. Although green and blue are the most common in part because red, green and blue components are used to encode the visible light spectrum, any key color can be used. Red is avoided for human subjects due to its prevalence in white skin tones, but can be often used for objects and scenes which do not involve people. Occasionally, a magenta background is used, as in some software applications where the magenta or fuchsia is sometimes referred to as "magic pink". A newer technique is to use a retroreflective curtain in the background, along with a ring of bright LEDs around the camera lens. This requires no light to shine on the background other than the LEDs, which use an extremely small amount of power and space unlike big stage lights, and require no rigging. This advance was made possible by the invention in the 1990s of practical blue LEDs, which also allow for emerald green LEDs. There is also a form of color keying that uses light spectrum invisible to human eye. Called Thermo-Key, it uses infrared as the key color, which would not be replaced by background image during postprocessing. For Star Trek: The Next Generation, an ultraviolet light matting process was proposed by Don Lee of CIS Hollywood and developed by Gary Hutzel and the staff of Image G. This involved a fluorescent orange backdrop which made it easier to generate a holdout matte, thus allowing the effects team to produce effects in a quarter of the time needed for other methods. In principle, any type of still background can be used as a chroma key instead of a solid color. First the background is captured without actors or other foreground elements; then the scene is recorded. The image of the background is used to cancel the background in the actual footage; for example in a digital image, each pixel will have a different chroma key. This is sometimes referred to as a difference matte. However, this makes it easy for objects to be accidentally removed if they happen to be similar to the background, or for the background to remain due to camera noise or if it happens to change slightly from the reference footage. A background with a repeating pattern alleviates many of these issues, and can be less sensitive to wardrobe color than solid-color backdrops. The biggest challenge when setting up a bluescreen or greenscreen is even lighting and the avoidance of shadow, because it is best to have as narrow a color range as possible being replaced. A shadow would present itself as a darker color to the camera and might not register for replacement. This can sometimes be seen in low-budget or live broadcasts where the errors cannot be manually repaired. The material being used affects the quality and ease of having it evenly lit. Materials which are shiny will be far less successful than those that are not. A shiny surface will have areas that reflect the lights making them appear pale, while other areas may be darkened. A matte surface will diffuse the reflected light and have a more even color range. In order to get the cleanest key from shooting greenscreen it is necessary to create a value difference between the subject and the greenscreen. In order to differentiate the subject from the screen, a two-stop difference can be used, either by making the greenscreen two stops higher than the subject, or vice versa. Sometimes a shadow can be used to create a visual effect. Areas of the bluescreen or greenscreen with a shadow on them can be replaced with a darker version of the desired background video image, making it look like the person is casting a shadow on them. Any spill of the chroma key color will make the result look unnatural. A difference in the focal length of the lenses used can affect the success of chroma key. Another challenge for bluescreen or greenscreen is proper camera exposure. Underexposing or overexposing a colored backdrop can lead to poor saturation levels. In the case of video cameras, underexposed images can contain high amounts of noise, as well. The background must be bright enough to allow the camera to create a bright and saturated image. There are several different quality- and speed-optimized techniques for implementing color keying in software. In most versions, a function f(r, g, b) → α is applied to every pixel in the image. α (alpha) has a meaning similar to that in alpha compositing techniques. α ≤ 0 means the pixel is fully in the green screen, α ≥ 1 means the pixel is fully in the foreground object, and intermediate values indicate the pixel is partially covered by the foreground object (or it is transparent). A further function g(r, g, b) → (r, g, b) is needed to remove green spill on the foreground objects. A very simple f() function for green screen is A(r+b) − Bg where A and B are user adjustable constants with a default value of 1.0. A very simple g() is (r, min(g,b), b). This is fairly close to the capabilities of analog and film-based screen pulling. Modern examples of these functions are best described by two closed nested surfaces in 3-D rgb space, often quite complex. Colors inside the inner surface are considered green screen. Colors outside the outer surface are opaque foreground. Colors between the surfaces are partially covered, they are more opaque the closer they are to the outer surface. Sometimes more closed surfaces are used to determine how to remove green spill. It is also very common for f() to depend on more than just the current pixel's color, it may also use the (x, y) position, the values of nearby pixels, the value from reference images or a statistical color model of the scene, and values from user-drawn masks. These produce closed surfaces in space with more than three dimensions. A different class of algorithm tries to figure out a 2D path that separates the foreground from the background. This path can be the output, or the image can be drawn by filling the path with α = 1 as a final step. An example of such an algorithm is the use of active contour. Most research in recent years[when?] has been into these algorithms. ^ From YouTube video "President Obama on Death of Osama SPOOF- BEHIND THE SCENES" (WebCite archive) posted to Crosson's secondary YouTube channel "Iman" on 8 May 2011. ^ The final (composite) video "President Obama on Death of Osama bin Laden (SPOOF)" (WebCite archive) posted to Crosson's YouTube channel "Alphacat" on 4 May 2011. ^ "What is Chroma Key?". Lumeo. Retrieved 3 July 2014. ^ a b "The Chroma Effect". Chroma Key Tutorial. BorisFX. Archived from the original on 15 March 2005. Retrieved 11 January 2010. If the foreground is a person then blue or green backing colour is recommended as these colours are not present in human flesh pigments. In fact, human skin colour is 70% red for all people regardless of race. ^ Kathryn Ramey (30 July 2015). Experimental Filmmaking: Break the Machine. p. 70. ISBN 9781136071508. ^ a b c d Foster, Jeff (2010). The Green Screen Handbook: Real-World Production Techniques. John Wiley & Sons. ISBN 978-0-470-52107-6. ^ "Illusions Take Home First Oscars". CRI English. 14 February 2005. Archived from the original on 15 March 2005. Retrieved 21 January 2009. ^ "The Keys To Chromakey: How To Use A Green Screen". Videomaker. Retrieved 23 October 2017. ^ Aronson, David (2006). DV Filmmaking: From Start to Finish, Volume 1. O'Reilly Media, Inc. pp. 52–53. ISBN 978-0596008482. ^ a b Bermingham, Alan (2013). Location Lighting for Television. Focal Press. p. 42. ISBN 978-0-240-51937-1. ^ "Creating an invisible cape in After Effects". Library.creativecow.net. Retrieved 20 July 2011. ^ "So you wanna make a theme?". skinyourscreen.com articles. Archived from the original on 29 October 2007. Retrieved 23 August 2008. ^ "What is Thermo-Key?". University of Tokyo. Archived from the original on 21 February 2009. Retrieved 21 January 2009. ^ Yasuda, K.; Naemura, T.; Harashima, H. (2004). "Thermo-key: human region segmentation from video". IEEE Computer Graphics and Applications. 24 (1): 26–30. doi:10.1109/MCG.2004.1255805. PMID 15384664. Retrieved 21 January 2009. ^ Sternbach, Rick; Okuda, Michael (1991). Star Trek: The Next Generation Technical Manual. Pocket Books. p. 13. ISBN 978-0-671-70427-8. ^ Steve Wright (22 November 2017). Digital Compositing for Film and Video: Production Workflows and Techniques. Taylor & Francis. p. 27. ISBN 978-1-315-28399-9. ^ Steve Wright (22 November 2017). Digital Compositing for Film and Video: Production Workflows and Techniques. Taylor & Francis. p. 29. ISBN 978-1-315-28399-9. ^ Yamashita, Atsushi; Agata, Hiroki; Kaneko, Toru (2008). "Every color chromakey". Icpr 2008: 1–4. doi:10.1109/ICPR.2008.4761643. ISBN 978-1-4244-2174-9. ^ Ashihkmin, Michael. "High Quality Chroma Key". University of Utah. ^ a b Cannon, Edward. "Greenscreen code and hints". ^ Aksoy, Yagiz; Aydin, Tunc; Pollefeys, Marc; Smolic, Aljoscha (2016). "Interactive High-Quality Green-Screen Keying via Color Unmixing". ACM Transactions on Graphics (TOG). 36 (4): 1. doi:10.1145/3072959.2907940. Wikimedia Commons has media related to Chroma key.